Cut the eggplant into slices, place them on a platter and sprinkle them with coarse salt. This is to remove moisture from the eggplant and thus make them crispier when fried. Dry the slices of eggplant well. Dip them in beaten egg and then in bread crumbs. Heat some cooking oil (not olive oil) in a pan and when it is very hot fry the eggplant. Prepare the tomato sauce by sautéing the onion with a little olive oil over low heat. Add the tomatoes and salt to taste, and cook for 10-15 minutes until the sauce has thickened. Add the basil at the end of cooking. Slice the mozzarella and leave to drain on a kitchen towel. Take a baking pan, cover the bottom with a few spoonfuls of tomato sauce. Make a layer of fried eggplant, then one of mozzarella and tomato. Sprinkle with lots of parmesan cheese. There will be 3 or 4 layers, depending on the size of the baking pan. After the layer of mozzarella, you can add a few slices of cooked ham and proceed as usual. 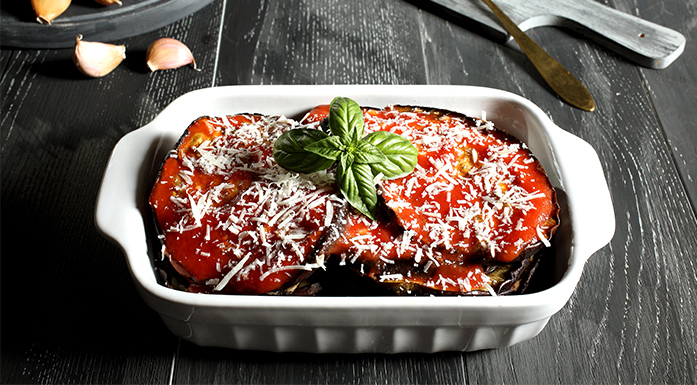 To make the dish a bit lighter you can grill the eggplant slices instead of frying them.